New Look Bingo | £50 FREE when you join NOW! 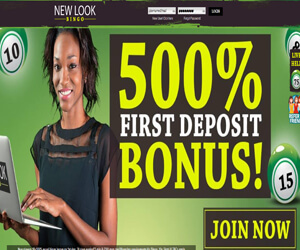 In January 2015 New Look Bingo launched a brand new look with a bright green colour scheme and a fresh new welcome bonus. New Look Bingo is member of the Live Bingo Network and runs on Cozy Games software. The site also offers mobile gaming available via smartphone and tablet so that you can enjoy your favourite games on the go. To begin with, when players join New Look Bingo and make their first £10 deposit they'll end up playing with £65! This includes £15 Free with No Deposit required plus a 350% first deposit bonus. Additionally, players can claim another combined 650% in deposit bonuses on their second and third deposits. In total you'll get 1000% in deposit bonuses on your first three deposits! In addition to the fabulous welcome package there's a whole host of other incredible promos at New Look. One of the top promos currently on offer is the Slots Summer Carnival, where you can play slots to win up to a fab £750 each week. You can also join the sizzling Jackpot Barbecue party to play in the daily, mega and super Jackpot Bingo rooms to win up to a scorching £10,750 reward. There are a host of other stylish promotions to choose from, such as a Bingo Star or Slots Whizz quiz, where you can compete to win up to a £250 bonus – so you really will be spoilt for choice! A range of different bingo variants are available at New Look including standard 75 and 90-ball bingo to 30-ball and 80-ball varieties. Super progressive jackpot games regularly feature £1,000 jackpots. There are also several free bingo options including the Fringo Free Bingo Tournament. In addition to bingo, New Look also has plenty of slots, casino and scratch games. Some of the top game tiles are the new Vegas Vegas Slots, Honey Bees, Queen of Legends and the ever-popular Plushie Pleasure.